SET of 6 SILICONE MOLDS, 6 DIFFERENT STLES: This professional quality silicone mold can be used to make chocolate bon-bons, mints, hard candy, gelatin snacks, gummies, ice cubes, butters, caramels, frozen baby foods, and so much more. Other creative uses include clay figures, resin casting, candles, soaps and more. VERSATILE: Soft, non-stick and flexible material, resist 450 degrees to the freezer without affecting the mold. They are odorless, nothing sticks to them. Soft, waterproof and most importantly, easy to de-mold! HIGH GRADE SILICONE: Made of FDA quality silicone, professional food grade, non-toxic. SAFE: Microwave, Oven, Refrigerator, Freezer and Dishwasher Safe. Temperature Safe from -40 to +450 degrees. DISHWASHER SAFE: Molds is dishwasher safe so cleaning is always quick, simple. GET CREATIVE! 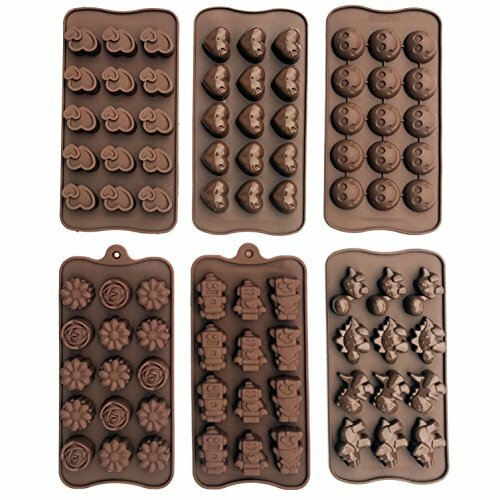 Our silicone molds are fantastic for making all types of treats! chocolates, bon-bons, crayons, candles, hard candy, fondant, Jell-O, frozen yogurt treats, ice cubes with fruit juice, cake decorations, party favors for birthdays & baby showers, and so much more! SAFE: Microwave, Oven, Refrigerator, Freezer and Dishwasher Safe. Temperature Safe from -40 to +450 degrees. DISHWASHER SAFE: Molds is dishwasher safe so cleaning is always quick, simple. GET CREATIVE! Our silicone molds are fantastic for making many types of treats: chocolates, bon-bons, crayons, candles, hard candy, fondant, Jell-O, frozen yogurt treats, ice cubes with fruit juice, cake decorations, party favors for birthdays & baby showers, and so much more! If you have any questions about this product by Talented Kitchen, contact us by completing and submitting the form below. If you are looking for a specif part number, please include it with your message.